You must be thinking "she's lost it now"! LOL. I'm so excited about this hose bib in my yard because now I don't have to drag a hose across the lawn to water my veggies in our North garden. ...to the existing valves for the irrigation system for the front yard. The valves are to the right of the tall holly bush. Mr. F. also tied into this line and hooked up a drip irrigation system so that the veggies in the raised beds and around the beds could be automatically watered on the existing timer. This is especially helpful when we go out of town. The black hose gets buried when it's all finished. 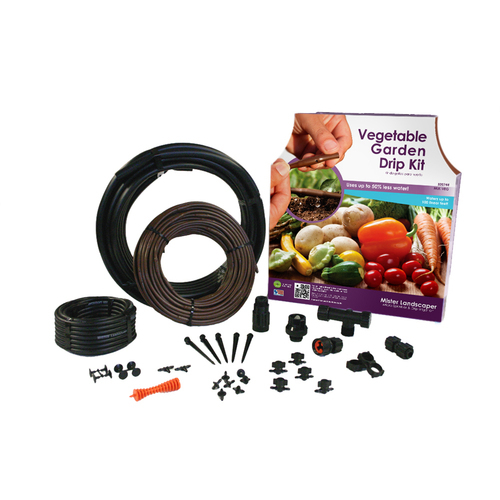 Lowe's carries a drip irrigation kit which is pretty easy to install if you have an existing water line near where your drip system will go. We bought all of our parts separately since we needed more than what the kit had in it, but the parts were mostly the same. The white pipe (water line) comes out of the ground and attaches to the black hose. Mr. F. ran the black hose down the middle walkway, then tied in the hose to the raised bed on the other side of the walkway. I'm so glad he does this work for us because it would take me hours days to figure it all out. The black hose is run along the side of the bed and was covered up with mulch when we were all through. Smaller lines are T'd into the larger black hose and then the drip line is attached to that. The brown hose has holes for the water to drip out every 12 inches. We use this type of drip for plants that are in rows. At the end of the run, the hose is just folded over and zip tied. Looks like my boy kitties are spying on each other. They are always out in the garden with us and curious what we're up to. The orange tool punctures a hole in the black hose so that a T can be inserted. Some of the plants have their own individual drip head that can be adjusted for more or less water flow, depending on the water need of the plant. I couldn't resist planting some things outside of the raised beds, so Mr. F. ran some drip heads to these plants, as well. A big thank you to Mr. F. for hooking me up with my drip irrigation system for our raised bed garden. Don't you just love things that make your life easier? Hope you enjoy your Wednesday! The above links are affiliate links, which means I'll make a small commission should you purchase something through one of these links. Wow this is impressive!! You will love it, such a time saver!!! Gorgeous garden! We definitely have this in the works, too! I love seeing how much you are enjoying it...totally worth it!! !